With four books in the bestseller chart, Dave Sebeslav has secured himself a place as one of the leading Western sellers in America. "A Long Way To Texas" from Dave Sebeslav is currently top of the pops! 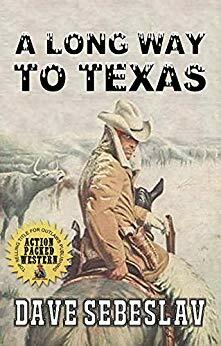 MIDLOTHIAN, Texas - Nov. 16, 2018 - PRLog -- It was announced earlier this week that Outlaws Publishing would be awarding Dave Sebeslav with a sales certificate to celebrate the success of his latest Western. "A Long Way To Texas" is now one of the biggest sellers in the United States. Sebeslav has three other novels on the bestseller chart too at this time. "A Long Way To Texas" tells the story of a restless and lonely Civil War veteran, Jake Christie, who leaves the family business in Springfield to venture westward, where relatives have settled on the Texas plains. On the way, he makes friends and enemies. Once there, he finds danger and the love of his life. This epic adventure has caught the attention of Western fans from around the world. "Our hit squad leads the way," Outlaws President J.C. Hulsey explained. "Readers are scouring the internet, searching new Western authors. We have a duty as a company to find the best writers with the greatest stories for our readers. We strongly believe that Kammen, Allen and Bailey will be the hitmakers of tomorrow—just as Winkle, Thompson and Sebeslav are the biggest hitmakers of today. "Outlaws Publishing, started in 2015, has gone from strength to strength with a series of Western smash hits from authors across the world. The company is currently having its strongest sales year with new authors signing," Hulsey explained, "and all indications are that we will just keep growing. The Western readership is alive and well. People want the entertainment they most enjoy. It gives me the greatest thrill when I hear from readers and discover how much they truly appreciated reading the latest Thompson novel—all our Western writers are doing great work, and we can't wait to see how readers react to our new signings." You can learn more about these new signings, Dave Sebeslav and about the company by visiting www.outlawspublishing.com. Alternatively, you can email jc@outlawspublishing.com to find out more.